GSMArena team, 29 June 2018. The rather unaffectionately named "slab" design has been, more or less, a staple of the smartphone realm for quite a few years now. Admittedly, it has become a little boring for many users. Even so, we can't, wholeheartedly refer to it as stale or stagnant. On the contrary. The standard bar phone from a few years back is vastly different from current models. Beyond curved panels and rounded edges, the general development path is pretty clear - all display and no bezels. Overall, it has been a slow and steady grind, slimming down chins and side bezels systematically. 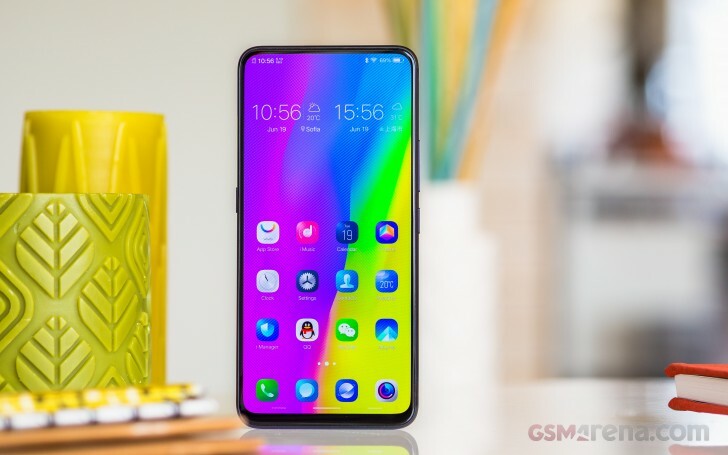 However, on occasion, devices like the concept vivo APEX come along and with them, a major step forward in all-screen design. But there's more to it than meets the eye as well. Display: 6.59" Super AMOLED display, FullHD+ 1080x2316 px, 19.3:9 ratio, 388ppi pixel density. Rear camera: Dual: 12 MP, f/1.8 aperture, 1/2.5", 1.4µm; Dual Pixel PDAF, 4-axis OIS; 5 MP, f/2.4 aperture, dual-LED flash. 2160p@30fps video recording. Front camera: Pop-up 8MP, f/2.0 aperture; fixed focus; 1080p/30fps video recording. OS/Software: Android 8.1 Oreo; Funtouch OS 4. Chipset: Qualcomm Snapdragon 845: 4x2.7 GHz Kryo 385 Gold & 4x1.7 GHz Kryo 385 Silver CPU, Adreno 630 GPU. Connectivity: Dual SIM; LTE Cat16 1024/150 Mbps; USB 2.0, Type-C port; dual-band Wi-Fi a/b/g/n/ac; GPS, BDS, GNSS; Bluetooth 5.0; 3.5mm jack. Like the APEX, the NEX S actually marries quite a few interesting technological solutions. All screen and no chin kind of necessitated the intriguing motorized, periscope selfie camera design. A feature that has already become the main attraction of the NEX family. 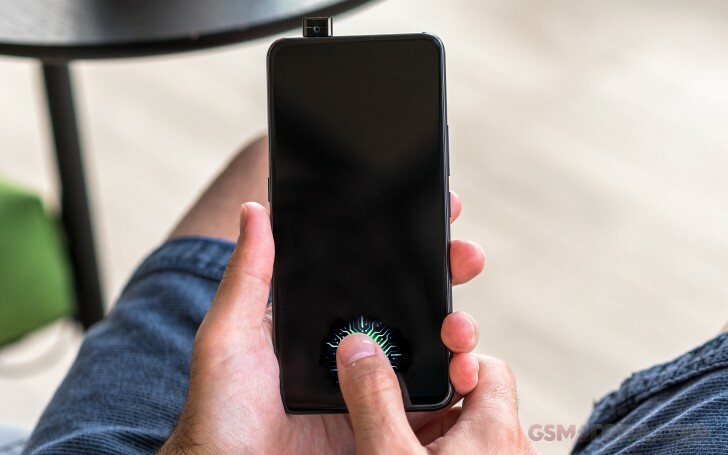 It's even stealing the spotlight from the gorgeous Samsung-made Super AMOLED display as well as the fingerprint reader hiding underneath it - all exciting features on their own. In our mind, the most impressive aspect of the NEX S is that it even exists in the first place. In one impressive swoop, vivo managed to take what was initially showcased as a tech concept and actually polish and push it to an end-user release. Frankly, a move that took most of the industry by surprise definitely raised the collective bar, in more ways than one. 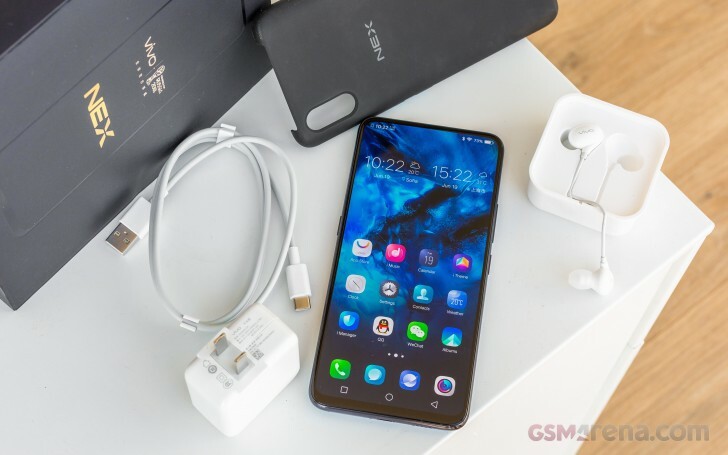 As such, the vivo NEX S is an important and monumental device. It will go down as a landmark in smartphone history. But, does that make it any good as an actual daily driver? One, usable and dependable enough to invest in and have by your side? Join us on the following pages as we try and look beyond the flashy exterior to find out. Vivo is one of the manufacturers who still believe in a good presentation, as a solid first impression for a product. We can't exactly say we wholeheartedly agree with that logic, since a box is a box and spending more on one, doesn't really make much sense. Still, it is kind of fitting to do something flashy for a device as iconic as the NEX S.
The box is a very thick and heavy, two-piece affair in all black, complete with a stylish embossed silhouette of the phone on the front. A FIFA World Cup 2018 logo is stamped on the top of the box. After all, there is no harm in reminding us that vivo is the official smartphone sponsor of the most widely viewed sporting event in the world. Inside the box - more thick cardboard and solid plastic cradles. No expense spared. The accessory bundle is impressively rich as well. It includes an impressively thin wall charger, rated for a solid 22.5W output. This seems to go beyond the Quick Charge 3.0 standard, capped at 18W. It could be some sort of Power Delivery implementation, which does make sense, since the Snapdragon 845, is compatible with Quick Charge 4+ and consequently up to 27W via the Power Delivery spec. In any case, you should hold on to the charger, just in case there is something proprietary about the tech. Plus, it's really compact. Besides the brick itself, you get a nice, thick USB Type-A to Type-C cable. Also, a pair of white vivo earbuds. Actually, it's a wired hands-free set, since it does include a microphone. Last, but not least, vivo threw a very nice soft case into the box. And it's not your standard, transparent TPU affair. It is made of thicker and really nice-feeling rubber, complete with an internal plastic shell, that is strengthened around the edges, for better protection and then thinner around the sides, for an easier grip.